I sat at a golf course all day long…sponsoring a hole for my company. It sounds nice, but if you’re not from Minnesota, you don’t know that it wasn’t a beautiful day, and there were torrential downpours on and off. I suppose I should be thankful for the fact that it wasn’t storming all day long, but still…wasn’t exactly what I had in mind. The point of the story is that it was a perfect spring day to use my slow cooker. Not only was I starving by the time I got home, but I was in no mood to make dinner. Thankfully I thought ahead and started dinner before I left in the morning. I found this recipe a few weeks back, maybe months, from Jessica at How Sweet it Is. Anything using chicken breasts in the slow cooker for an entire day…sign me up! I used a little less chicken, probably 2 pounds, and used frozen chicken breasts so that they could cook a little longer before I got home from work. The only thing I omitted was onion powder, but not because I don’t like it, but because I didn’t have any on hand. As Jessica suggested, I used a little more beer because the sauce I was using was a bit thicker. Plus, I couldn’t use only 8 oz of beer and let the other 4 oz go to waste! The result was a little runny, but really, it was no problem because the chicken was so super moist. I didn’t add the additional barbecue sauce directly to the slow cooker before serving, instead I added it to my sandwiches directly so it wouldn’t get watered down. The flavor of the chicken was amazing; I added a little hot sauce to mine to spice it up! I could definitely see this being a regular in our dinners because it’s so easy, we almost always have the ingredients, oh, and it’s delicious! 1. Season chicken with paprika, garlic powder, salt and pepper. Place chicken in slow cooker. Add beer and 24 oz barbecue sauce and cook on low for 8 hours (you can cook for longer if you use frozen chicken breasts, mine cooked for almost 10 hours and probably could have cooked longer). Shred chicken with two forks. 2. Preheat broiler. Place sliced hamburger buns sprayed with olive oil under broiler until well toasted, about 2-3 minutes. 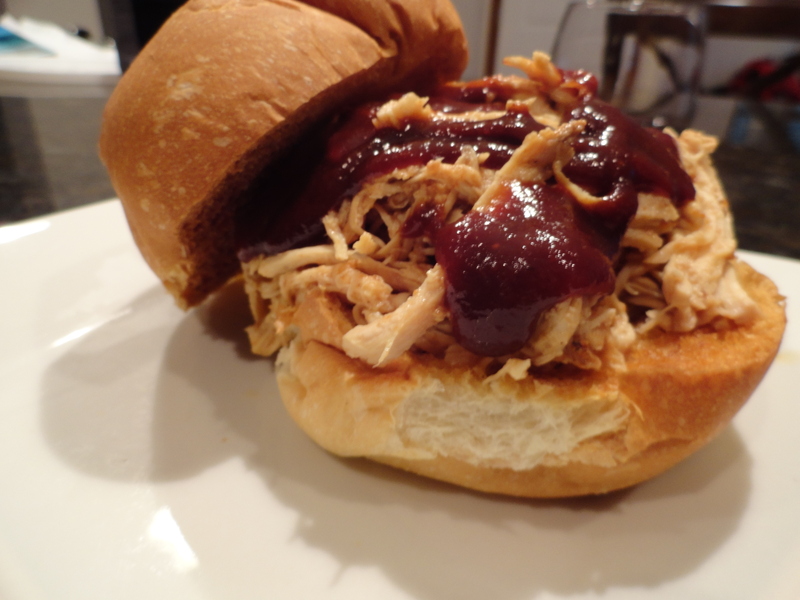 Place shredded chicken on top of buns, add remaining barbecue sauce and serve. Sounds good…the smoked paprika must have added to the flavor. Thank you! It did give a nice smoky undertone, almost as if the chicken were smoked.